I began in Osh by staking out the transport firms, finding just one truck going ‘soon’ and manned by a hyperactive little Russian who cheerfully demanded one hundred dollars for the entire journey. It was too early for highway robbery – so after some friendly banter I resolved to hit the bazaar in the morning. That meant another pleasant evening spent with fellow travelers in a bizarre chaikhana where we watched Kyrgyz totter the streets on bowed and drunken legs while talking to a melancholy left-behind Russian, and drank with a sozzled plastic map dealer, who had disappeared New Zealand. 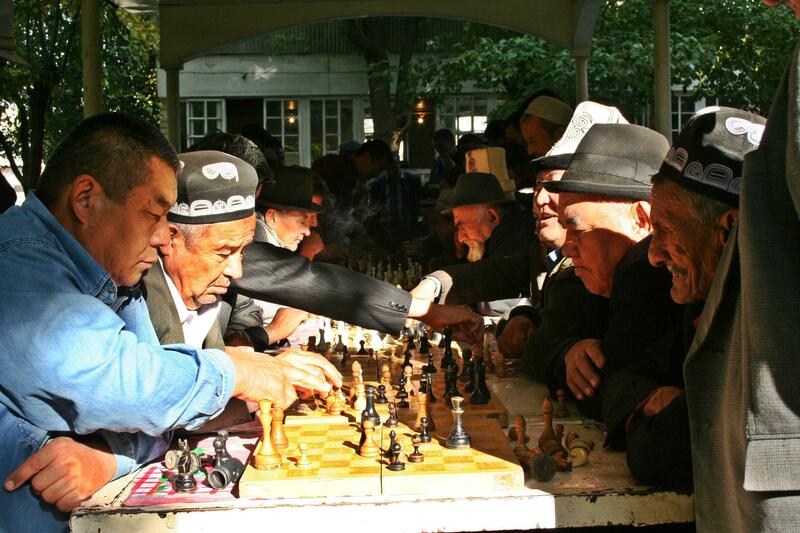 The nomadic Kyrgyz were pushed south as the Mongol Empire expanded and they speak a Turkic language – though in appearance they have a healthy smattering of Genghiz’ genes. Their Islam is lightly held in comparison with their more religious neighbours, the Uzbeks.Vodka and horsemanship seem to have as great an attraction. At the bazaar’s jeep stand in the morning, the first leg to the border town of Sary Tash proved easy enough, though we were delayed by passenger defections and the ensuing co-operative crisis. By dusk, I was at the only intersection in this two-horse town when Khoroz appeared and told me of his ‘hotel’. The warmth of the kitchen was intoxicating and grandchildren set out the quilts for my bed. We softened bread with mutton soup, drank sweet tea and watched the movie Cliffhanger via satellite, so badly dubbed into Russian that I think Sly Stallone was making sense. Perfect. Next day the old buccaneer Khoroz gave me a terrible rate for my ten dollar bill, and pocketed the change. He offered a ride to the Pamir turn off, and when he asked for petrol money I matched his business acumen by telling him I had nothing. He barked out a laugh, pirate to pirate, and gunned the Volga down the gravel. In the daylight the view from Sary Tash was stunning – the Pamir is laid out East to West in majestic and snowy perfection, like some Hollywood backdrop. Metal containers at the turn-off housed a narcotics checkpoint, manned by cheerful Krygyz in a range of uniforms. The premise is that eighty percent of Afghanistan’s illicit crop is routed through Tajikistan toward Russia and Europe, but this seemed to be more of an official bribing station, as no vehicle was actually being checked. A truck ghosted by after only an hour and I recognized the shifty driver from Osh. He had killed the engine to slip through the sleepy narco-cordon, but the officers have a visitor with a car and duly gave chase. Upon returning to pay the road-tax, the Kyrgyz business woman who had hired the truck was livid. Meanwhile we embarked upon a side deal for a berth to Murgab and I was hastened into the cab. When the good lady of commerce espied me encroaching upon her ample seat all hell broke loose in Russian and Krygyz – and the dodgy truckie turfed me out with an apologetic shrug. After only forty minutes another old Russian truck – and I began thinking that the fierce reputation here is nothing but an old hitcher’s tale. This time there were only two in the cab on a bench seat made for three, but there were packages and the incumbents would not move. And so I sat in the weak sun and continued with The Great Game – in more ways than one. One by one the officers interviewed me as to my provenance, profession and marital status and soon have me invited into the shacks for tea, and then lunch. The hours draggaed by and not a single vehicle until six when the sun had given way to a sharp wind and flurries of fine snow, and no-one in their right mind was heading up to the border. Using my discretionary better parts, I was soon back in the warmth of Khoroz’ kitchen – drinking tea and laughing. Tonight we have Jean-Claude van Damm, in fact two for the price of one as he is playing twin brothers, one simple and one evil – perfect. The following morning Sary Tash was covered in fine snow and columns of white smoke plume from every house, the burning dung acrid in the still air. 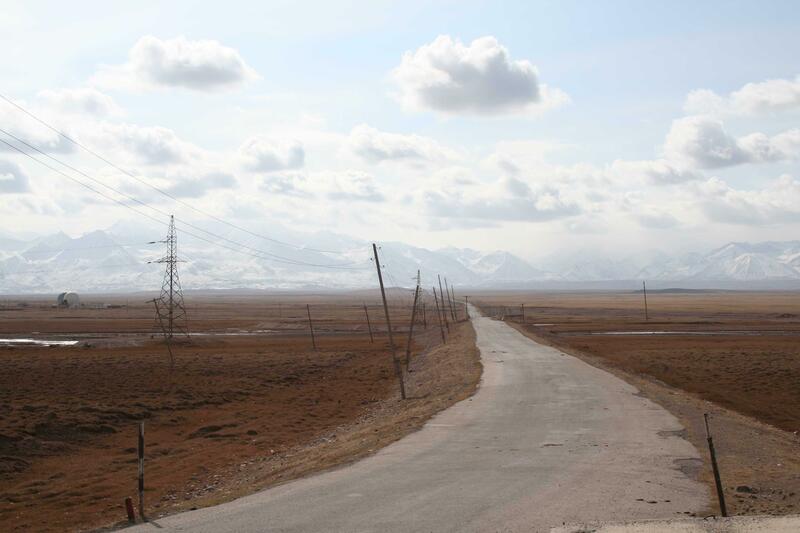 Old Khoroz was not falling for the same trick again, so I marched toward the turn off until a Chinese trucker taking the low road to the Tajik capital stopped in a swirl of dust and air-brakes. Back at the turn-off the game began again, though this time I was armoured with full thermals and intended to fight harder for a seat. The good men of narco-control were up and brushing their teeth, and I delivered cheap cigarettes to curry more favour. 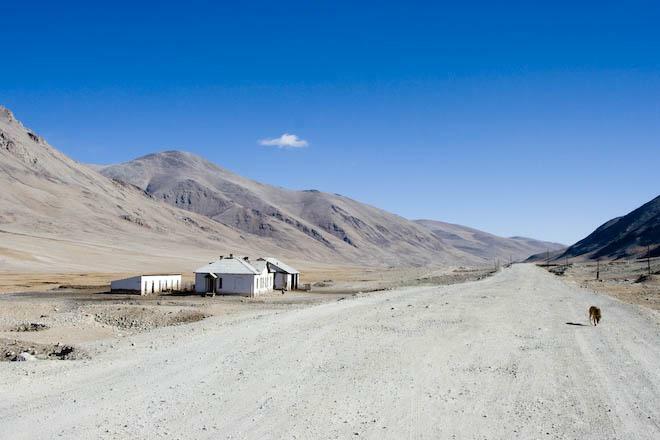 At first nothing – and then three cars, all of them headed to Murgab, the central town of the East Pamir. The first was informed that they would be including me in the bill of lading, and I was happily ensconced in the back seat of an ex-Danish Audi with five smiling Kyrgyz spanning three generations, the youngest staring intently at my hair. And so we set off with the two other cars ahead breaking the crust of snow. We climbed slowly, weaving to avoid the potholes and baking with the heater on and sun bright on the windows. The border was a chance to pat dogs and share biscuits with my new family, then onwards and upwards to the Tajik border post with their bored soldiers and dogs. As we ascended again to 4700m, the mountains were close on all side – then we were through the Northern range and dropped down to a lake plateau. The hardy Kyrgyz stopped every hour or so to chip ice from our wheel arches and I marvelled at how an ordinary car can cope if driven carefully. Lunch was at the only town on the shores of Lake Karakol, pristine amidst the snow and unfrozen due to its high salt content. We pushed on and drove into the dusk, passing three cars headed the other way, one of them a broken Lada with four cold and lonely men hoping for something to happen. By night I didn’t notice we were in Murgab, because there is no electricity on certain days. But we stopped and asked after a hotel and a drunken man and his son hopped in to direct. I was eventually shown a room complete with a despondent British cyclist I had met weeks ago, though poor Tim was now a biker without a bike. He had been forced to leave it late at night with a broken down jeep and a driver for whom he has no name or number. Tim was running out of time with both the weather and his visa, and my arrival brought welcome relief – and a dinner greased with celebratory and consolatory vodka. The next day a fellow lodger promised me a ride to Khorog, but never returned. Another guest promised to pick me up at one, but again didn’t show. So Tim took me down to the motley collection of sea containers that was the bazaar, and we talked to his familiars. Murgab was a collection of single story mud brick houses, each with a courtyard, dogs and bundled children. Due to Soviet whimsy, the population is actually mostly Kyrgyz, while the remaining quarter are Pamiri Tajik. The Pamiris are from different stock, probably east Iranian, and are Ismailis, a Shia sect for whom the Aga Khan is the spiritual leader. Just off the bazaar I found myself praying with any sect anywhere, sitting in a tiny Chinese mini-van waiting to fill with passengers. Four hours later the sun was low in the sky and so were my spirits. In an hour it would be dark and we were just starting out. I told the driver I can’t go – I’ve waited too long to travel the Pamir at night. Meanwhile Tim’s bike had turned up and that night’s vodka was the inverse of the night previous. . The next morning after a few dusty hours in the bazaar I procured a seat in a Uaz, the doughty Russian van much prized in the mountains, and left poor Tim bargaining to get north to Kyrgyzstan with the two days left on his visa. Before leaving we loaded in a slaughtered yak and its salesman, and whoever else we met upon the way. The van-owner was PamirBek, who turned out to have good English from years of guiding trekkers and hunters and he happily provided commentary. But silence was also welcome, because the Pamir highway was breath-taking. The plateau valleys continued in autumnal shades, lower and drier than before, walled up in the distance with bluff peaks that would be at home in the Rockies. 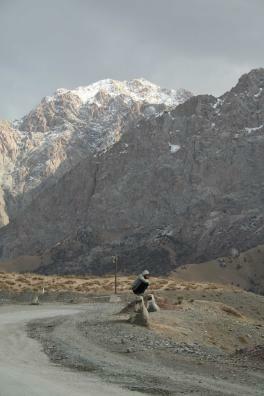 We were descending slowly, following a river that would eventually join with others to define the frontier with Afghanistan. PamirBek couldn’t help playing guide and we stopped at a roadside inn for fried fish and then soaked in natural hot springs toward dusk. And eventually we were there, in the handsome Pamiri capital of Khorog, perched in a small alpine bowl at the confluence of two mountain rivers, though I didn’t discover this till morning. In five days I had traveled just seven hundred kilometers, and every minute a trip.